Are you in business to win? We deliver media training, stakeholder engagement, communications audits, online reputation management, government relations, product launches and straight up publicity and marketing campaigns. What can we do for you? Big Bang Communications is a strategic communications consulting business offering concept-to-completion communications solutions for B2B and B2C clients ranging from technology innovators to established service industries and trusted national associations. Based in Victoria, British Columbia, the Big Bang team delivers creative and unique perspectives and solid communications service. Our award-winning approach supports your organization goals and business. You can trust us with your marketing and communications needs. Training (media relations, spokesperson, email marketing, social media for business, government relations). Corporate branding, media relations, content strategy, traditional marketing and copywriting services are available on exclusive retainer contracts, per project or just when you need a hero to parachute into your story. 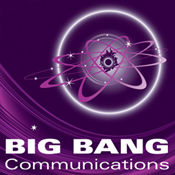 Big Bang Communications – Helping you communicate what matters. Call us or email today – agency quality without the agency fees. Robyn is an excellent presenter. She really engaged our members with her talk on Digital Content Strategy. The topic was particularly apt and more than one of our members told me afterward that Robyn’s perspective made them re-think their web and social media communications strategies. Robyn took on a challenging project with our association. We needed to change the public image of our industry and persaude municpalities around the value of our communities. It was obvious Robyn spent time to learn about our industry. Using focus groups and interviews, she developed a plan with viable strategies we can implement in pursuit of our goals. To finish the project Robyn conducted a well received training workshop for our Board - over and above the requirements of our RFP. Your workshop at Creating Connections 5.0 conference really helped me with my LinkedIn profile. I thought you were very inspiring! I went to your workshop on online branding today at Creating Connections 5.0 - I loved your talk! You were awesome – everyone appreciated the “wrap up” session you put together, so quickly – it is something we are considering for future events because you did it so well. Robyn and Katie from Big Bang Analytics went above and beyond in service delivery to both the Ministry team and the participating districts. School District participants feedback about Big Bang Analytics was overwhelmingly positive. BBA used Agile approach to development, took incredibly complex dataset, transforming into two well-received dashboards in under 12 weeks. I sincerely enjoyed working with Big Bang Analytics. Robyn's insights into completing one's personal profile on LinkedIn were excellent and very helpful. I plan an extensive revamp of my profile based on her input! Bree Sharratt, PhD	President and Lead Consultant, Sharratt Research and Consulting Inc.
Robyn Quinn helped create a sponsorship package for Us and Them, a film I made about homelessness and addiction. She knew funds were limited and agreed to work pro bono. She enthusiastically shared her extensive marketing knowledge and experience. Robyn was able to help me understand and use LinkedIn more effectively, she is a great presenter! Robyn delivered two seminars for Duncan Chamber members. She does a great job – with ready and thorough answers for attendees. With a wealth of experience and success, she speaks to what works, and helps members understand what strategies are best for their particular needs. And members appreciate it – we receive very positive feedback on Robyn’s seminars. I heartily recommend Robyn as a presenter.